the farmers of the Kashmir valley are a helpless lot today. They remain a mute spectator to the havoc wrought by lethal 'paddy blast' disease on their standing paddy crop spread over 12,000 hectares (ha) of land. The worst hit districts are Anantnag and Pulwama. Around 4,600 ha of land under paddy cultivation in Anantnag and around 3,800 ha of land in Pulwama district have come under the grip of this disease. Paddy blast is a disease that affects the pellet of the paddy plant. Caused by a fungus, the pinnacle of the paddy plant is broken thereby severing water supply to the pellet. With the result, the pellets do not transform into grains. "Climatic conditions have changed considerably in the valley. Temperatures have risen and precipitation level has fallen. Coupled with the old farming techniques, these conditions are conducive for the pathogens to flourish and affect the paddy crop," says A M Shah, Director, Research Division, Sher-e-Kashmir University of Agriculture Science and Technology (skuast). According to Shah, the wild weeds present in the nurseries can prove to be the breeding grounds for pathogens. Agronomists maintain that most of the farmers are using old farming techniques and sowing the seed varieties that are susceptible to the paddy blast disease. "We have discovered two indigenous varieties of paddy seeds -- Jhelum and Chenab, which can resist the disease to an extent. Unfortunately, only 10 to 12 per cent of the farmers sow such seeds," laments Shah. Jammu and Kashmir's Minister for Agriculture Chaudhary Mohommad Ramzan asserts that the government has taken appropriate measures and minimized the impact of the disease. "We have sprinkled fungicides over large tracts of land. We have organised around 175 awareness camps, arranged seeds for the next kharif from safe areas and pressed several skuast scientists into service on a war footing to bring the disease under control," explains Ramzan. 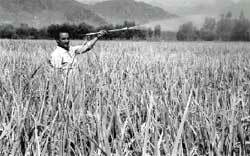 "Paddy blast caught peasants and the government by surprise. Farmers did not cooperate with us and they do not adopt the scientific methods and techniques," he adds. On the other hand, most farmers complain that the government officials and scientists do not bother to visit the far flung areas, where the intensity of this disease is more. "Government is doing nothing actually. We have been witnessing drought and paddy blast disease for quite some time. The government only steps in when we tell them that something adverse is happening in the fields. It is their job to visit farms regularly and prescribe the fungicides for countering the disease," fumes Abdul Majid, a farmer of Anantnag district. However, Ramzan underlines that finances were the major handicap earlier. "The Union government has now released Rs 20 crore under micro management programme and we are now able to manage things effectively. A full-fledged survey to assess the actual damage by the disease is in progress," he informs.